The main parts of a pbook (printed book) book are the spine, front cover, front matter, body (or body matter), back matter and back cover. There’s no anti-matter unless you’re writing sci-fi. Ebooks have images of front covers (and sometimes even back covers). What follows is a typical sequence for front matter. Sometimes pages and sections are skipped, or sections are combined or switched around. Pages in the front matter traditionally have no page numbers printed on them, or have Roman Numerals. Since I publish my own books, I make my own rules, and I like numbers on almost every page and I avoid Roman Numerals. When you publish your book, do what you prefer—but prepare to be criticized if you vary from tradition. IMPORTANT NOTE: Because of the growing importance of online sales, there is a trend to move some items that traditionally were in the front matter into the back matter, or to eliminate some items entirely. This way, people who are glancing through your online sample quickly get into the "meat" of the book and are not delayed by uninteresting pages. Sometimes the first recto page will have comments from readers or reviewers to help sell the book. Some books have several pages of comments. I think one is enough. Three pages of glowing and gushing endorsements may help to make a sale if someone is browsing in a physical store or online, but they are wasted on a reader who has bought the book wants to skip the “commercials” and start reading. One page may help reassure customers that they made a good choice, but don’t waste any more trees or electrons. Sometimes the first verso page will have a list of the author’s other books, blogs, etc. I put this up-front in my early books, but the list has grown and is in the back matter of my recent books. The back of the title page is usually called the copyright page. It has the copyright notice, the ISBN to identify your book, Library of Congress catalog information (if any), and the printing history or revision or version. It may also contain disclaimers or legal notices, and contact information. Tip: If your book is published after September, use a copyright date for the next year. This way your book will always seem to be one year fresher as it ages. The table of contents can be an important sales medium, so make it complete, clear, informative and well-written. If chapter titles don’t explain what the chapters are about, put in some explanation. For a fiction book, you can skip the table of contents, unless the book is a collection of short stories. The sequence of chapters and the numbers of their starting pages will frequently change as the book evolves, so make sure the final version is accurate. I once left two chapters out of a table. Note: most ebook formats are "flowable" and the books have no fixed page numbers, just a sequence of chapters. It’s frequently recommended that you call the table simply “contents” and leave out “table of.” However, James Felici, author of The Complete Manual of Typography, one of the best-looking and most informative books about the publishing business, has a full-fledged “Table of Contents.” I would never criticize him, and if you put out a book as good as his, I won’t criticize your table of contents either, no matter what you decide to call it. James came up with a nice innovation that you may want to emulate. Ahead of his complete ten-page table of contents he has a one-page “contents at a glance” to make it easier to find the major sections. If you have a large complex book, try it. If you have charts, tables or illustrations, you can put a list of them and their pages after the table of contents. If you don’t think people will be impressed by the list, or will look for specific items, it’s probably a waste of space. As with the table of contents, make sure the page numbers (if any) are accurate. The acknowledgment (or “acknowledgement”) is the section where you thank the people who helped you to research, write and complete the book. You can just have a list of names, but it’s more common to have at least a sentence to explain what each person did. I sometimes combine the dedication, thank you and acknowledgement into one section. I've even thanked the people who buy my books. This is a good place to flatter your seventh-grade English teacher if she was not listed earlier on the dedication page—especially if you think she’ll show off the book and help to sell more copies. The prologue goes only into a fiction book. It usually introduces a character, or provides a "back story" that’s important for understanding the book. Prologues are a bit old-fashioned, and often what is put into a prologue could function as your first chapter. Now, at last, the front matter is finished and you get to the part of the book that matters most—the body matter, or just “body.” It’s usually divided into chapters, but the chapters may be included within several sections or parts. The body typically takes up 90% or more of the book. An addendum seldom appears in a Print On Demand book or ebook. It’s a section where the author can provide additional material, explanations or corrections that couldn’t be in the body of the book because those pages were printed already. It may be an actual printed page bound into the book, or a separate piece of paper, a CD-ROM, or even an online file. The index is an alphabetical list of words and phrases used in the book, with the pages they are found on. Indexes can be constructed by a PC, or manually by the author or a professional indexer. If you make any changes that could cause words to shift from one page to another, you'll have to redo the index. Ebooks are usually searchable and don't need an index. The term “colophon” comes from Latin and Greek words for “finishing,” and usually explains why the book looks the way it does. It may include a list of typefaces used, and indicate who designed and printed the book, and possibly some technical details of the printing. A colophon is not mandatory nor common, but I sometimes use one because it gives me a chance to sound off about bookmaking. It’s common for a book to have a paragraph or even a page or two “about the author.” It should be written in the third person, even if you write it yourself. Make it interesting and entertaining, and convince potential readers why they should trust you and your book. Include your photo if it's not on the book's cover. Finally, after all of the printed pages, most paper-based books have one or more blank pages. Books are printed from large sheets of paper called “signatures” that are cut to provide different quantities of different size pages. It’s unusual for a book to be designed with a number of printed pages that perfectly matches the number of pages provided by the signatures. Consult with your printer to find out the possible number of pages you can have. 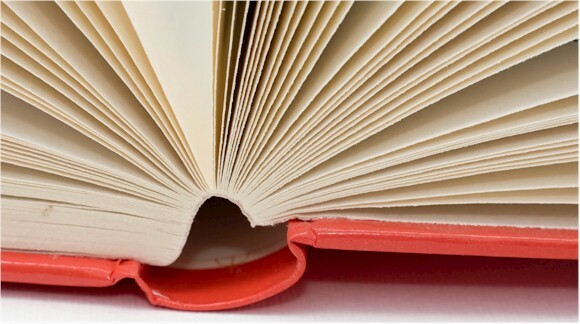 By slightly stretching or cutting your book, you can minimize the blanks at the back. It looks really stupid—and wastes trees—if you have half a dozen blanks. Some printers, and vanity presses such as Infinity Publishing, even put blanks in the front of the front matter. That’s unforgivable. Ebooks seldom have blank pages.